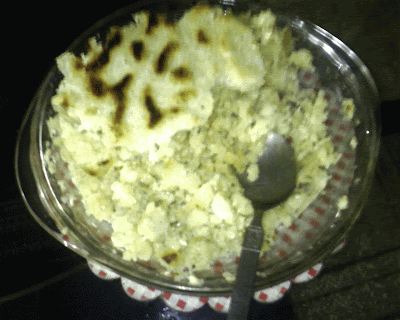 Yesterday my wife baked us “rotis” (rounded breads made of flour and baked on flat pan, called “tawa”). But this time instead of wheat flour, she used flour made from corn flour (not cornflour) – called “Makai ki Aata.” And we ate this sweet smelling bread with “saag” (spinach cooked in oil with lot of spices) – believe me anyone who has not tasted this dish, has missed a lot (so next time you are in Pakistan, insist your host to treat you with saag, bread made from corn flour, different from corn flour available the world over, and homemade butter). And whenever the “makai ki roti” is baked, a few are set aside to make “choori.” Don’t know what choori is? OK let me explain how choori is made. Any number of “makai ki roti” are put in a utencil, and is minced with hands while it is still steaming hot (I admire our female folk who do this with their bare hands and almost burn their fingers with the steam oozing out of sizzling hot bread). While it is being minced, butter and sugar is also mixed with it and the three substances are continued to be minced until sugar is no more felt as an alien. And then we all eat the “choori” as a very indigenous sweet dish.